An awe-inspiring view of Paro valley from our hotel balcony at COMO Uma Paro at 6.45am. Time flies and this was the last day of our trip before flying back the next morning. Waking up to such awesome views, we would definitely want to return and stay with COMO Uma Paro again in the future. Breakfast with a view of the Paro valley. Great food, great service, great views. If only breakfast is like this everyday. Getting ready to check-out from this lovely hotel. 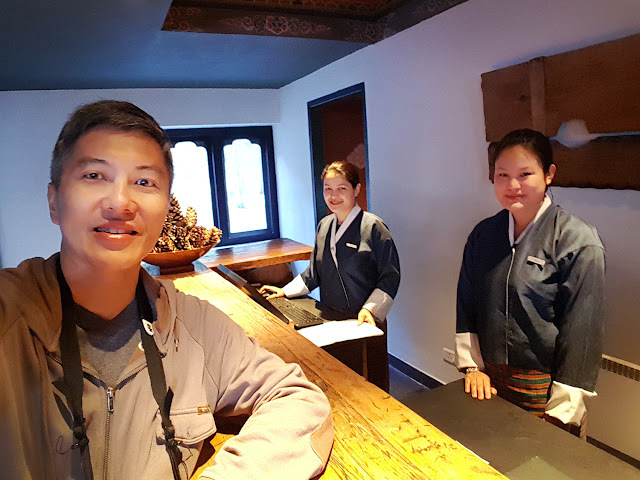 A memorable wefie with the lovely staff at COMO Uma Paro after my check-out was done. 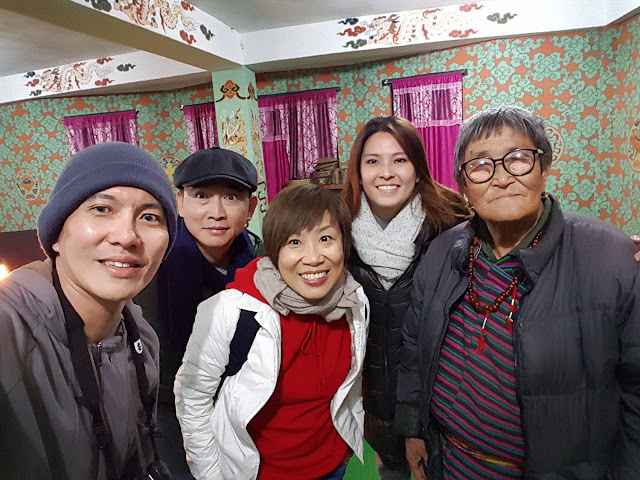 All dressed up in gho and kira and posing for a wefie with our fantastic driver, Mr. Sangye (first from left), our jovial guide, Mr. Jigme (second from left), and our lovely friend from the hotel, Ms. Yeshi (second from right). On our way to Dochula Pass (again). Incidentally, our trip had coincided with the Dochula Druk Wangyel Festival which is held on the 13th of December every year. As the name suggests, it's held at Dochula Pass. 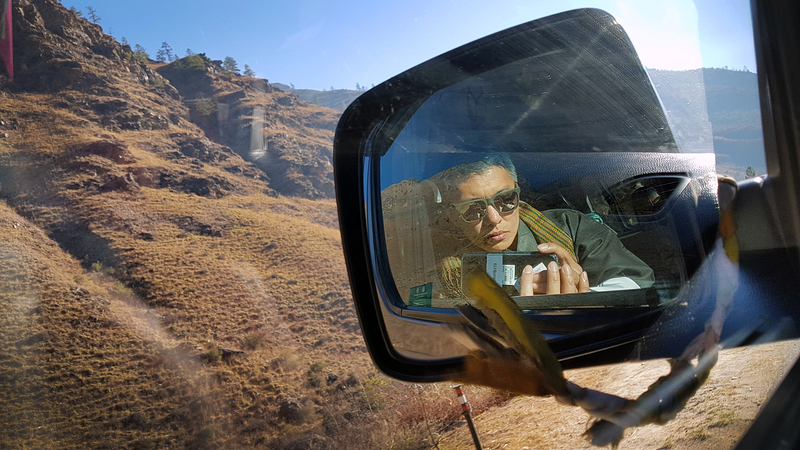 Bored with the 1.5 hour journey and started taking selfies through the side mirror. I had swapped with our tour guide and taken the front passenger seat again to prevent motion sickness. Some parts of the journey were well-paved, smooth, and scenic. And some sections were tormenting due to road improvement works. Passed by some small towns and had a glimpse into the locals' way of life. This was the third time we were at Dochula Pass, once on Day 3 and another on Day 4. However, it was very different today with an obviously much larger crowd, mostly dressed in their traditional costumes. It would take approximately 15 minutes to get to the festival ground on the hilltop from the car park. Looking back halfway up the hill, we could get a good view of the Druk Wangyel Chortens, or the 108 memorial chortens. Our cheerful tour guide, Mr. Jigme, getting some warmth in the cheerful morning sun. A huge crowd had gathered around the festival ground, which uses a green plateau as the stage and with magnificent views of the Himalayan mountain range as its backdrop. 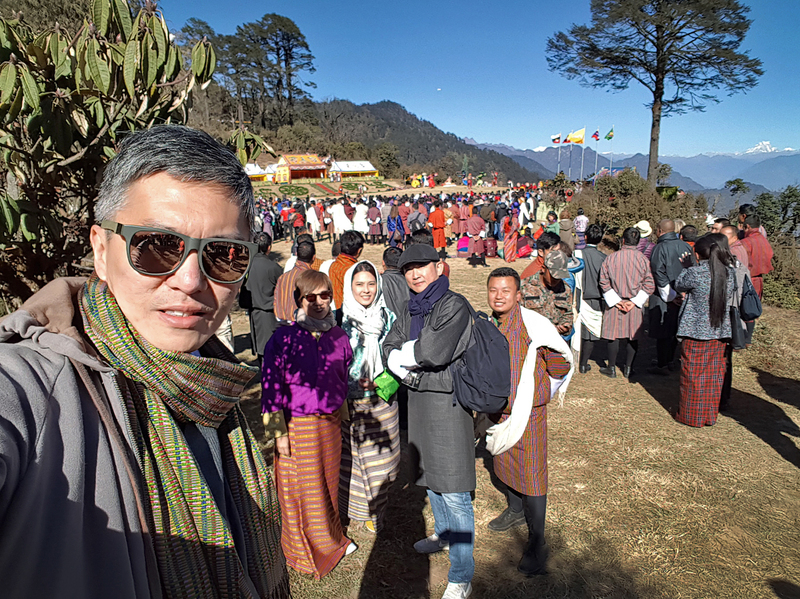 A wefie with the festival. Average temperature in mid-December ranges from 5 to 10 degrees Celsius. Very sunny but we were still feeling cold. Catching the signature jump by the key performer. We wonder if he was shivering in the cold morning wind. The Druk Wangyel Festival was established only in 2011. The festival is to commemorate His Majesty the Fourth Druk Gyalpo and the Armed Forces’ victory over Indian insurgent forces residing in southern Bhutan in 2003. The colourful costumes and dramatic dance of the Dochula Druk Wangyel Festival. A fascinating display of dance and choreography, all against the stunning backdrop of the Himalayan mountain range. At more than 7,000 metres, it's possibly the tallest backdrop for any stage. An adorable girl standing on a chair and dancing to the music. A complete catalogue of kira and toego. The kira is the national dress for Bhutanese women. It is an ankle-length dress consisting of a rectangular piece of woven fabric wrapped around the body. Although there is a half-body kira available which is more like a long skirt. The toego is a long sleeve short jacket worn over a kira. And finally, the long scarf called rachu. A fish-eye view of the festival ground. The few tents on the left were where the royal family members and VVIP guests were seated. My new toy for this trip - the Samsung Gear 360. A fantastic tool to capture (and devour) the entire environment with just one click. Extravagant costume against a magnificent backdrop. The Prime Minister of Bhutan, Mr. Tshering Tobgay (third from left), and the Queen Mother, Ashi Dorji Wangmo Wangchuck (first woman in front), gracing the occasion. Queen Mother and ministers gathering for a group photo. Joyful and friendly children posing for a photo at the festival. We spent close to 2 hours at the Dochula festival and headed back to Thimphu for lunch. Caught a great view of the capital before entering town and let's see if you could spot the giant Buddha again. After an unhurried lunch at Thimphu, we were back in Hotel Tashi Namgay in Paro. Had wanted to try the traditional hot stone bath but decided better not to in such freezing temperature. Walked along the river bank in front of the hotel and the views were stunning. A lovely puppy at the hotel driveway. Visited the main street of Paro on our very last evening for some last minute shopping before flying off the next day. No need for fancy LED or neon signs. Our favourite shop to get more gho and kira, and anything to help us dress up more like a local. More kira shopping - totally spoilt for choice. A young woman working patiently on colourful tassels used for altar decoration in temples. Fascinated by my camera, this little boy had stopped and posed for a photo on the street. Bhutan's 7-Eleven. There are plenty of "General Stores/Shops" which sell anything and possibly everything a local needs. Young monks on the streets of Paro. Spotted a few modern-looking cafes amidst rows of traditional Bhutanese crafts and sundry stores. Slowly but surely, the fabric of Paro is evolving and we may see more of such modern amenities in the near future. A provision shop owner watching television and having dinner with his family. A wefie with the family before we left for our own dinner. We were not being rude or intrusive. The shop owner is a good friend of our tour guide and driver. Mr. Jigme, our tour guide, all changed-up and ready for a cold night at the farmhouse where we'll be having our dinner. Our guide had arranged for a different kind of dinner for us on the very last night of our stay. We were brought to this local farmhouse in the middle of nowhere, up and cold in the mountain for our dinner. Beautifully hand-painted walls and beams surround the interior of the farmhouse. And proudly on display were none other than pictures of the 5 honourable Kings of Bhutan. Simple and delicious home-cooked Bhutanese food, paired with a glass of local whiskey - an essential for such freezing night. A final wefie with the farmhouse owner (extreme right). Thank you for such a fabulous dinner! After dinner, we were presented with a series of local song and dance, all performed with 'live' folk music. The lively dance had brought us through the many facets of Bhutanese history, art, culture, and their way of life. Inevitably, the song and dance had reminded us of the Dochula Druk Wangyel Festival we were at in the morning today. And at more than 3,100 metres above sea level at Dochula Pass, that was certainly always a festival above the rest. Hi Peter. 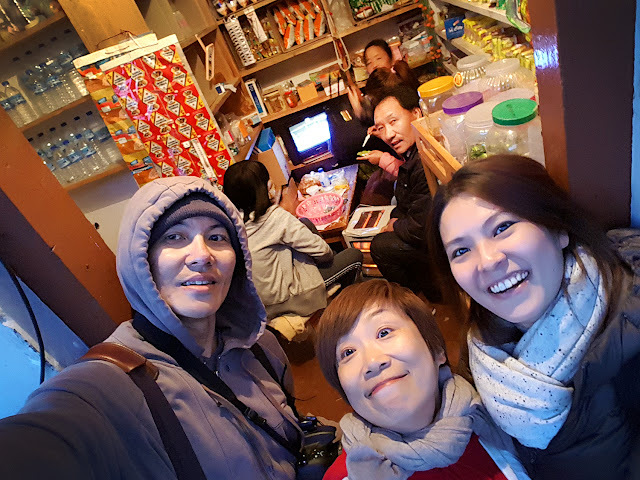 Am glad that the photos and writings could be of any help for your upcoming trip. And thank you for the compliment and encouragement! Feel free to let me know if you any questions. Most importantly, enjoy your trip! Cheers! Love to see more posts from this festival's photography.